While you’d expect to find them in your local pond, they’re also some of the biggest contributors to modern medical research. And there’s a reason these so-called “lower” organisms have been swimming, hopping and squirming their way into labs at the Oklahoma Medical Research Foundation: They’re key players in the war against disease. 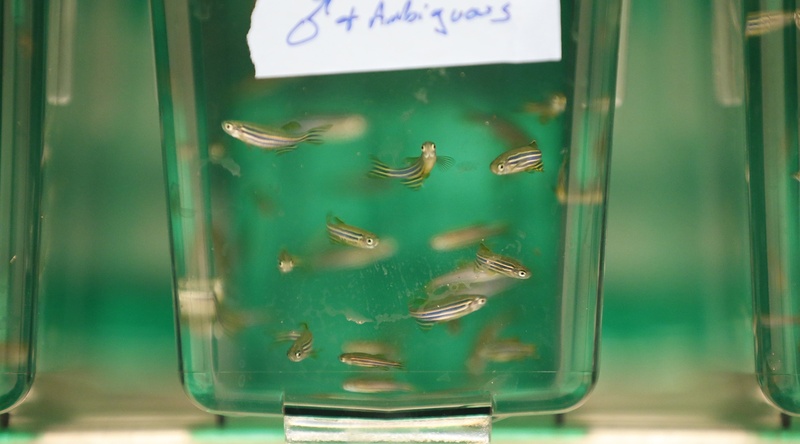 “Humans are incredibly complicated and it’s difficult to do experiments with them, so we have to use animal models instead,” said OMRF researcher David Jones, Ph.D.
Jones relies on zebrafish, which grow to a length or one to two inches and are named for the horizontal stripes that run along their bodies, to research colon cancer and other diseases. “If you really want to know how something works, you have to study the simplest models possible so you can study them in-depth,” Jones said. Jones is not alone in tapping these tiny creatures to learn about the human body. For decades, researchers have performed experiments with mice. But scientists are increasingly branching out to use other organisms—like fish, mice and frogs—to understand complex biological processes. This trend has come about thanks to innovative technologies known as “functional genomics,” which enable scientists to study the biological functions of genes. “We can utilize powerful genetic tools and the animals’ short life cycles to understand these processes more economically and more quickly than ever,” said Jones. The lessons scientists learn from other organisms can teach us a lot about ourselves, as we share a surprising amount of genetic material with some unlikely cousins. “All organisms are made up of cells, whether they’re a person, a fish or fruit. In fact, our genomes are 40 percent identical to a banana,” said Jones. The zebrafish that Jones works with share 70 percent of humans’ genetic code. Their utility in experiments is enhanced by the fact that they reproduce frequently, are fully developed in a matter of days, and are transparent, allowing scientists to easily observe their developing cells. “In two years, I learned more from zebrafish than I had learned in 18 years studying human cell lines,” said Jones. Forsthoefel is hoping that clues he learns from the tiny worms, which have the ability to regenerate themselves and their organs completely, might lead to new help in treating conditions ranging from bowel disorders to paralysis. “It might be possible to improve our own regenerative abilities just by promoting or inhibiting the action of one or two genes,” said Forsthoefel. Susannah Rankin, Ph.D., another OMRF researcher, uses frog eggs to study cell division. Her observations in amphibians could provide important information on how to prevent the development of tumors in humans. “Now we can use these organisms to study thousands of genes and do it fast and at low cost,” said Jones.